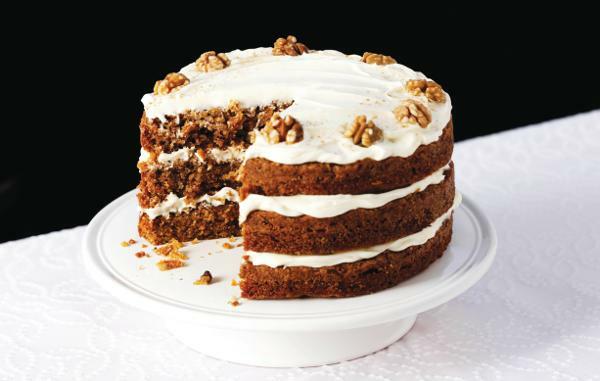 Christmas Carrot cake (Carrot and walnut cake). One of the cakes that always triumph where I take them, for its flavor and juiciness that makes it appetizing at any time and occasion, so I have decided to prepare it for the Christmas meal with a very cheerful decorated Christmas tree shape, which I’m sure everyone will like it! 160 g (1 and 1/3 Cup) All-purpose wheat flour. 250 g (1 and 2/3 Cup) Pane sugar or brown sugar. 250 g (2 Cup) Grated carrot. 2 Teaspoons Baking powder or baking powder. 80 g (1/2 Cup) Chopped nuts. 120 ml (1/2 Cup) Neutral oil (Sunflower, seeds, Etc.). Butter to flattened the mold. 350 g (2 Cup) Cream cheese. 125 g (1 Cup) Butter without salt. 200 g (2 Cup) Sugar icing or impalpable sugar. To taste Gel green coloring. 1. Prepare the cake: In a large bowl sieve the flour with ground cinnamon, baking powder, add the salt and mix it a bit and reserve. 2. In another container put the oil and sugar, mix well, add the eggs one by one mixing very well after each incorporation, add the sieved flour mixture little by little and stir well until completely integrated, add the nuts chopped and mixed a little, finally add the grated carrot mixing it very well. 3. Pour the dough into the previously greased and floured mold, bake with the preheated oven at 175ºC (350º F) with heat up and down and without air for 25 to 30 minutes, if it is a wide and flat mold, if it is a mold round smaller bake for 45 to 55 minutes (Check by sticking with a toothpick that is already cooked). Once baked let it cool completely on a grid. 4. Prepare the cream of cheese: In the bowl of an electric mixer put the butter (that this a while at room temperature) beat a few minutes, we add little by little the icing sugar previously sifted and beating slowly so that the kitchen is not full of sugar, when it is already integrated the sugar we beat at maximum speed during about 7 minutes lowering the cream off the sides of the bowl, we add the cream cheese very cold and we beat another 5 minutes more. 5. Separate a part of cream that will serve to fill the cake, the rest of the cream we add the dye and beat well until it has the color we want. 6. If we have used a fir-shaped mold, we simply place it on a cardboard base, but if we have used a rectangular mold we cut a template with the shape of the fir and cut the sponge cake with that shape. 7. We spread the bottom of the sponge cake with a thin layer of white cream that we have reserved and we spread it out very well, cover it with the other half of the sponge placing it so that it is even with the bottom, press lightly to settle the 2 parts, cover the whole tree with a thin layer of green cream by rubbing it with a spatula and leaving the trunk uncovered, let cool 15 minutes in the refrigerator. 8. Put the green cream in a pastry bag with small star nozzle and begin by covering the sides of the troco tree making small tufts until it is all covered, we leave the natural trunk of the cake and the rest of the tree we cover with the pastry bag in the shape of branches as I explain in the video, let stand 30 minutes in the fridge. 9. We decorate with the decorations that we have chosen and we pass it to the serving tray very carefully and ready to enjoy. So, this is the recipe for Christmas Cake with carrot and walnut. Easy to prepare at home. Try it you will love it ! !